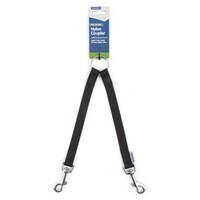 Ancol Nylon Couples Lead For Dogs is a double lead attachment that allows you to exercise more than one dog at once. Made from strong durable Nylon, the individual leads have been industrially sewn using a unique "flag" pattern for additional strength and both feature a sturdy metal clasp to ensure a secure fastening onto your dog's collar. Each lead is approximately 12" (30cm) long and will hold up to a 50kg dog.